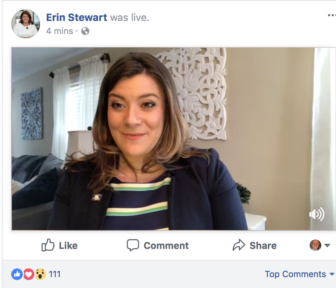 New Britain Mayor Erin Stewart announces her exploratory campaign for governor on Facebook Live. New Britain’s young Republican mayor, Erin Stewart, opened an exploratory campaign for governor Monday to test whether Connecticut is ready to elect its first millennial to statewide office. She announced her plans on Facebook Live. With nearly a dozen Republicans already raising significant funds in runs for governor, the 30-year-old mayor, who has been elected three times in a largely Democratic city, said she feels her time has come to test the waters. “I’m a different kind of Republican. I’m not going to be put in a box by a party or one person in Washington,” she said. After a brief snafu with a weak internet connection, Stewart made the just-over-four-minute announcement from her living room to about 450 people who were watching live. Within the hour the video had been viewed by several thousand. Stewart enters the field behind a long list of other Republicans, and her exploratory campaign also could position her as a running mate for lieutenant governor or one of the other statewide constitutional offices. Stewart described herself as a fiscal conservative who holds a gun permit, is pro choice and an advocate for civil rights. She said she was passionate about the success of Connecticut’s cities. The Connecticut Democratic Party Chairman Nick Balletto said Stewart is anything but different from the typical Republican. “In practice, Stewart has proven herself a loyal cutout of Donald Trump’s Connecticut Republican Party. With a track record of appeals to party leaders when times are tough, she will have to do more than just stay silent when hard choices have to be made,” said Balletto in a statement. Stewart long has commanded media attention. She was just 26 when she won the first of three two-year terms in 2013, taking over government in a financially struggling and racially diverse city where non-Latino whites are a minority and Democrats overwhelmingly outnumber Republicans. Candidates to win statewide office in Connecticut while still in their 30s include Republican John G. Rowland, elected governor at 37 after failing at 33, and Democrat Chris Murphy, elected to the U.S. Senate at 39 and trying to be re-elected this fall at 45. Both had previously served at least three terms in Congress. Stewart is a rarity among Republicans on a few counts: She raised taxes by 11 percent and sharply cut spending to balance her first budget, then embraced Gov. Dannel P. Malloy’s much-maligned bus rapid transit line, CTfastrak, as a boon to transit-oriented development in downtown New Britain. She raised taxes a second time by 3.1 percent. Democrats questioned her financial acumen in the 2017 municipal elections, using the recent downgrade of the city’s general-obligation bond rating by Moody’s Investors Service, which cited a reliance on non-recurring revenues in recent years. She countered by noting that S&P Global upgraded the city’s bond rating by four levels in two upgrades in 2016 and affirmed its A-plus status in 2017. Republicans lost control of the city council, but Stewart was re-elected easily. She now is engaged in a standoff with the Democratic majority over how to cope with a coming balloon payment on debt run up by her predecessors, including her father Tim Stewart. She was blocked last week for the third time in an attempt to pass a restructuring plan.